Nutritional hemp comes from the same species as marijuana, but from a different variety bred to have virtually none of the psychoactive chemical THC. Instead, nutritional hemp is bred to emphasize its array of essential fatty acids, especially the omega-3s. Hemp seeds provide a good balance between omega-3 fatty acids and omega-6 fatty acids. (It is thought that the typical Western diet contains too much omega-6 and too little omega-3.) They are also very high in protein, and the protein from hemp seed is considered to be a complete protein because it provides all of the essential fatty acids. Two tablespoons of hemp seed butter provides 160 calories, 7 g carbohydrate, 11 g protein, 9.8 g fat, 1 g dietary fiber, 10 mg sodium, and 3.6 mg iron. The main ingredient in hummus is garbanzo beans, which are high in fiber and protein but low in fat, and hummus shares their benefits. (See Chapter 2, Carbohydrates: Starchy Vegetables, for more on the Benefits of garbanzo beans.) Most hummus also includes tahini, a sesame seed paste, and olive oil. Both of these are high in monounsaturated fat, and consequently high in calories, but the amounts in hummus are relatively small. Hummus usually also contains lemon juice and garlic, and it may have cayenne pepper or other spices for variation. This mix of foods provides healthy fat, high protein, and lots of fiber. One-fourth cup of hummus provides 105 calories, 12.4 g carbohydrate, 3 g protein, 5.2 g fat, 3.1 g dietary fiber, 15.5 IU vitamin A, 5 mg vitamin C, 36.5 mcg folic acid, 107 mg potassium, 150 mg sodium, 69 mg phosphorus, 30.7 mg calcium, and 17.8 mg magnesium. Olives are high in monounsaturated fat and provide iron, vitamin E, and fiber, and they also contain anti-inflammatory flavonoids and phenols. Olives that are naturally purple or black contain anthocyanins as well. Olive oil is a key component of the �Mediterranean diet,� which appears to contribute to lower rates of heart disease and obesity. (ripe olive) One large pickled ripe olive provides 5 calories, 0.3 g carbohydrate, 0 g protein, 0.5 g fat, 0.1 g dietary fiber, 18 IU vitamin A, 38 mg sodium, and 4 mg calcium. 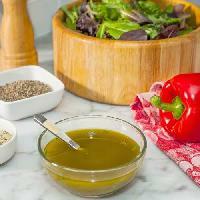 (olive oil) One tablespoon of olive oil provides 124 calories, 0 g carbohydrate, 0 g protein, 14 g fat, and 0 g dietary fiber. Pecans have the highest oxygen radical absorption capacity (ORAC) among nuts, and they are high in antioxidant properties in general. Pecans also play a role in lowering cholesterol, due not only to their fiber but also to plant sterols. Eating pecans may increase metabolic rate. One ounce of raw pecans provides 190 calories, 5 g carbohydrate, 2 g protein, 19 g fat, and 2.7 g dietary fiber. Pine nuts are the seeds of pine cones. China and Portugal are the largest exporters of pine nuts, and they are also grown in the United States. Most of the pine nuts grown in the United States are from one of three pinyon pines�the Colorado, Mexican, or Single-Leaf pinyons. There are more than 20 varieties of pine trees that produce an edible seed, and the nutritional value varies somewhat among them, but most pine nuts can be counted on to provide protein, fat, and the B vitamins thiamine, niacin, and riboflavin. They are also a source of magnesium, iron, and phosphorus. More than half of the carbohydrate in pine nuts is dietary fiber. Pine nuts also contain pinolenic acid, which appears to stimulate the production of two hormones that suppress appetite. One ounce of dried pinyon pine nuts provides 178 calories, 5.5 g carbohydrate, 3.3 g protein, 17.3 g fat, 3 g dietary fiber, 8 IU vitamin A, 1.2 mg niacin, 16 mcg folic acid, 178 mg potassium, 20 mg sodium, 10 mg phosphorus, 2 mg calcium, 66 mg magnesium, 1.21 mg zinc, and 1.23 mg manganese. Pistachios are rich in potassium, phosphorus, and magnesium, and they are also a good source of vitamin B6 and thiamine. They are high in fiber, a good source of protein, and low in saturated fats. Pistachios are good for cardiovascular health, and they help maintain proper metabolism. One ounce of dry roasted pistachios (47 nuts) provides 172 calories, 7.8 g carbohydrate, 4.2 g protein, 15 g fat, 3.1 g dietary fiber, 67 IU vitamin A, 17 mcg folic acid, 275 mg potassium, 135 mg phosphorus, 20 mg calcium, and 37 mg magnesium. Because they are high in zinc, pumpkin seeds are a natural protector against osteoporosis. They are also a great source of magnesium, which helps balance calcium metabolism and may contribute to bone health. Pumpkin seeds are a natural anti-inflammatory and may help counteract the kidney stone�forming effects of oxalates found in many dark green, leafy foods that are otherwise good in nutritional value. One-third cup of pumpkin seeds provides 110 calories, 14 g carbohydrate, 5 g protein, 5 g fat, 2 g dietary fiber, and 1000 mg sodium. Red wine is listed here because in carbohydrate exchange programs, it is counted as a fat. It contains 7 calories of fat per gram, which is higher than both carbohydrates and proteins, though not quite as high as true fats. Nonetheless, red wine has been shown to have significant Benefits consistent with its origins in red grapes. It is a source of resveratrol, the substance found in the skins of red grapes and therefore in red wine that was originally thought to be among the reasons those who eat a so-called French or Mediterranean diet had a lower risk of obesity and heart disease. Resveratrol is produced by plants as an antimicrobial, to fight bacteria or fungus, and has been found in animal trials to lower blood sugar, reduce inflammation, and fight some cancers. It also appears to extend the lifespan of some insects and fish and, in a 2008 study, was shown to reduce the formation of plaques in the brains of animals, pointing toward a potential role in preventing Alzheimer�s disease. So far it has not lived up to its promise in human trials, in part because a human dose equivalent to those used on experimental mice would require between 761 and 5,000 glasses of wine per day. As a result, resveratrol is no longer regarded as the main factor in the �French paradox,� but it is still the subject of study for its many and varied possible health-enhancing properties. Red wine also provides polyphenols known as oligomeric procyanidins that may help reduce the risk of heart disease and diabetes. Three and one-half ounces of red wine provides 74 calories, 1.8 g carbohydrate, 0.2 g protein, 0 g fat, 0 g dietary fiber, 2 mcg folic acid, 115 mg potassium, 5 mg sodium, 14 mg phosphorus, 8 mg calcium, and 13 mg magnesium. There are two types of safflower oil. The most common one is oleic safflower oil, which is largely monounsaturated and high in omega-9 fatty acids. The other type is linoleic safflower oil, which is largely polyunsaturated and high in omega-6 fatty acids. The oleic type may help increase memory and lower blood pressure, while the linoleic may help improve diabetes symptoms and has been shown to prevent some forms of cancer in mice. One tablespoon of safflower oil provides 124 calories, 0 g carbohydrate, 0 g protein, 14 g fat, and 0 g dietary fiber. Sesame seeds are high in iron, magnesium, manganese, and copper, and they also provide phosphorus, vitamin B1, zinc, and dietary fiber. The hulls contain a significant amount of calcium, though seeds without hulls do not. 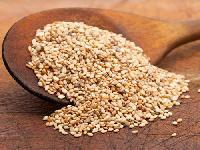 Sesame seeds also contain two unique substances: sesamin and sesamolin. Both of these substances belong to a group of special beneficial fibers called lignans, which have been shown to have a cholesterol-lowering effect in humans and to prevent high blood pressure and increase vitamin E supplies in animals. Sesamin has also been found to protect the liver from oxidative damage. One ounce of toasted sesame seed kernels provides 161 calories, 7.4 g carbohydrate, 4.8 g protein, 13.6 g fat, 4.8 g dietary fiber, 19 IU vitamin A, 27 mcg folic acid, 115 mg potassium, 11 mg sodium, 219 mg phosphorus, 37 mg calcium, 98 mg magnesium, 2.21 mg iron, and 2.9 mg zinc.